Peter Kory is a LibraryThing Author, an author who lists their personal library on LibraryThing. See Peter Kory's author page. 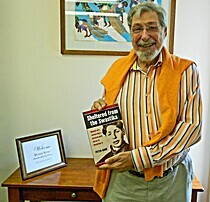 About mePeter Kory was born in 1931 in Berlin, but left for Belgium with his family to escape the hostile Third Reich. His parents ultimately perished in Auschwitz, after being caught in the Pyrenees, trying to escape Vichy France in 1942. Peter led a clandestine life as the purported scion of an old noble family in its ancestral château--an important center of French Resistance activities even though it had been commandeered by the SS to serve as their regimental headquarters. In 1953, he graduated from City College of New York with a degree in architecture, served in the U.S. army and helped transform Cincinnati's Central Business District before joining the New York State Urban Development Corporation. He subsequently held executive positions with the John W. Galbreath Company, one of the nation's most prolific developers of office buildings and, in 1982, began developing property on his own behalf. He has taught architecture at the University of Cincinnati and was chairman of a National Transportation Research Board on Joint Transportation and Land Development. He was a member of the Urban Land Institute executive group, where he participated in a number of study panels dealing with a wide range of urban problems. He lives in Key Biscayne, Florida with Joyce Indingaro Kory, his wife of 20 years. He has two grown children and four grandchildren.